“It’s a lovely, warm, cosy retreat – we love the all too comfortable beds"
"A lovely relaxing weekend in a beautiful well equipped cottage"
“A haven of peace in a very busy world." This award winning self catering accommodation sits on the courtyard of a historic estate in South Wales, surrounded by beautiful farmland. 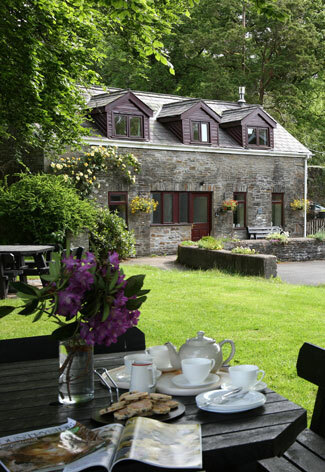 The cottage is perfectly suited for a family holiday, romantic getaway or short break in Wales. Although this cottage is wonderfully situated for enjoying all the famous attractions South Wales has to offer, you may simply wish to spend lazy days enjoying the cottage and over a hundred acres of private grounds with walks from the cottage door. Unlike many other self catering cottages on the market, Hafod y Wennol comes with over a hundred acres of private grounds which guests are free to explore. The accommodation has a large lawn area with views over the sheep grazed parkland – many of our guests love sitting under the giant beech trees, enjoying a glass of wine and watching the lambs play under a setting sun. As with all the cottages at Plas Farm, we have done our best to think of everything you could possibly need for a superb break in Wales. The farmhouse style kitchen-diner is superbly equipped with a Belfast sink and full range of modern equipment, including a fridge.